So as promised I took today off and went for a wander. I took the bus downtown (only $1.75 one-way) from the campus and headed to downtown Cincinnati. The journey only took a few minutes – the route was walkable in terms of distance but it was downhill all the way (so if you were walking back it wouldn’t be fun) but more importantly it didn’t look like a great neighbourhood to be walking through in the first place. A lot of derelict buildings, and some odd looking people. On my way in something caught my attention as being odd (to my eyes) but I couldn’t work out what it was. It was only on the way back that I realised I hadn’t seen a single white person in that area. So definitely not an area to walk through I think. I wandered around downtown a bit. There does not seem to be a vast amount in the city centre itself. Most of the museums are outside the downtown area. But it was worth it as I now know where things like the main bus terminus is. And I think it should be fairly straightforward to use public transport to get around. I also located the main shopping centre – so I’ll probably go there one weekend and have a nosy around. 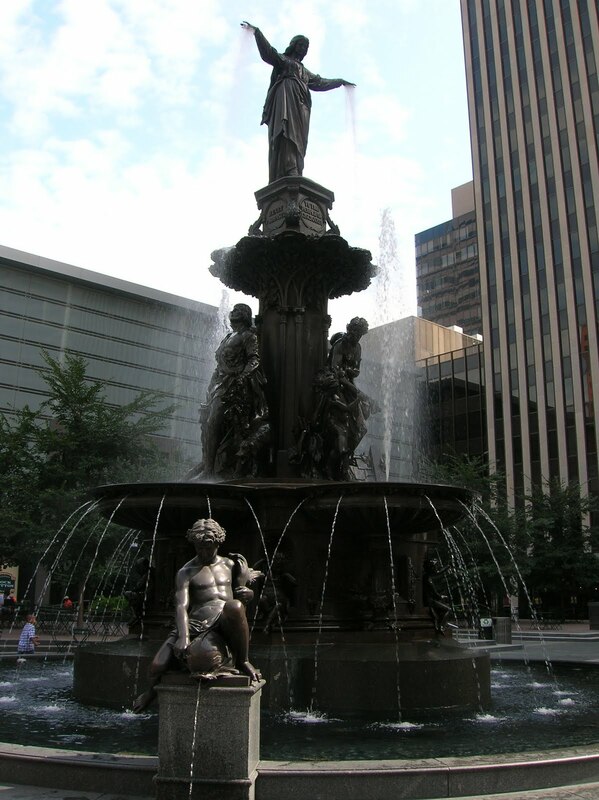 I also stopped off at Fountain Square which has a rather large and impressive over-the-top fountain (hence the name). It is rather ornate isn’t it? After this I decided to head over the river to Newport to see if I could get a paddle-steamer ride along the Ohio River. To get there was a little bit of a walk but required the crossing of the river. This was achieved using the ‘Purple People Bridge’ – it has a proper name but apparently ‘Purple People Bridge’ is what most people call it these days and how it is signposted. Newport is in Kentucky and seemed rather nice. A lot of work has gone to the waterfront area (now known as Newport-on-the-Levee) and there is a good range of shops and bars/restaurants. I also spotted the Aquarium and I’m planning on going there another day. 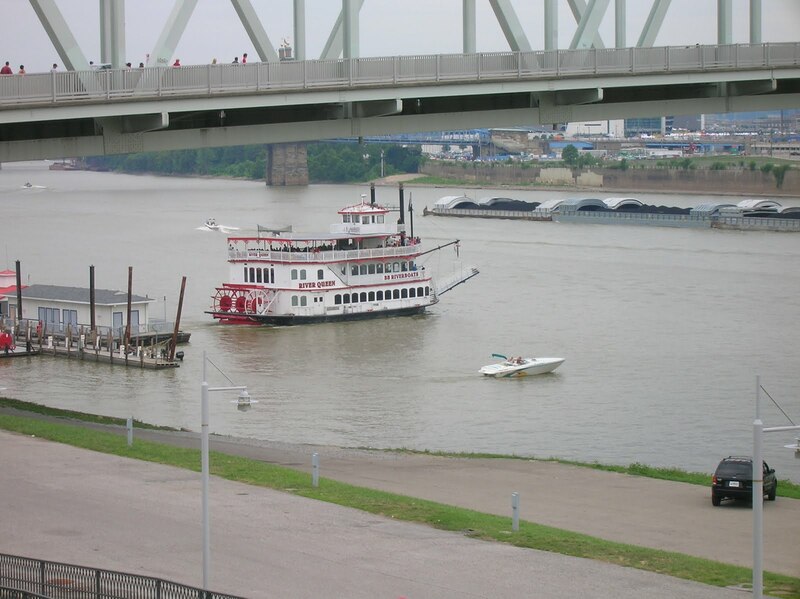 I had seen the paddle-steamer port from the Cincinnati side of the river, and the boat was in dock. I made it just in time and got on a few minutes before that tour left. They only seem to run every other hour. The tour took a hour and was really nice. 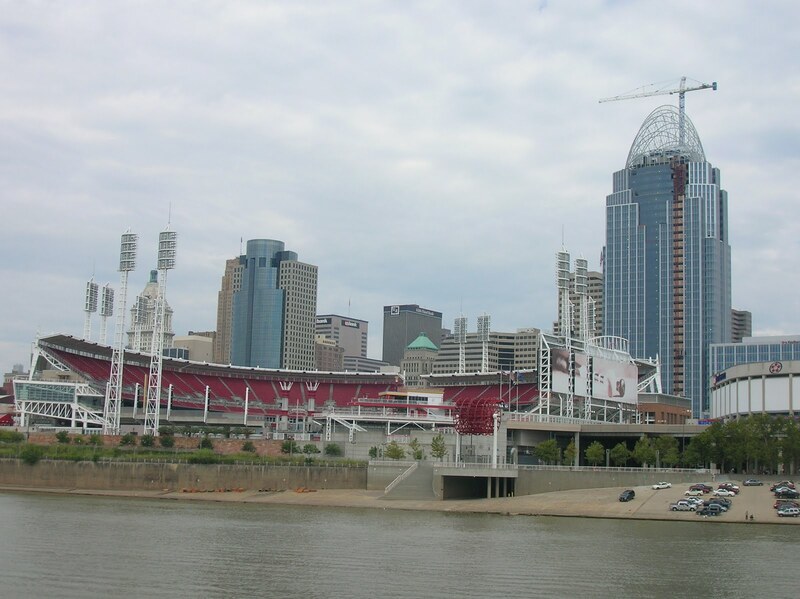 We went up and down the river, past Covington and Newport on the Kentucky side and Cincinnati on the Ohio side. The boat was called the River Queen and it was built in the 1930s. I’ve captioned all the pictures so it should be fairly straightforward to look through them. There was about 200 people on board (most in the indoor buffet area) and about 50-75 on deck so it wasn’t too crowded. There seemed to be an Amish family outing taking place on deck (obviously not too traditional as a lot of them had sunglasses on and digital cameras). It was quite interesting to see them – especially the women’s outfits with the quite formal dresses and bonnets. There also seemed to be an awful lot of kids with them – it seemed as though there were about 3 per adult and there were at least 15 adults! After the cruise I had some lunch at the mock-Irish pub at the Levee, had a lovely smoked salmon salad and a pint. Then I walked back over another bridge – spotting the River Queen departing on her next tour. As I was walking back across the river I became aware that there were a lot of people walking to Cincinnati – all in baseball jerseys – I overheard that there was a game starting at 4pm. Then I caught the bus back to campus, I’m possibly going out for a drink tonight with Claire as she had left a note under my door while I was out.